The majority of Plastic Surgery is performed in the outpatient setting, and in the San Francisco Bay Area, the majority of the these procedures are performed in Outpatient Surgery Centers. These facilities offer many advantages to patients and plastic surgeons, but are they safe? How can you be certain the ambulatory facility your cosmetic surgeon is using is up to the high standards required for surgery? As a Board Certified Plastic Surgeon and an active member of both the American Society for Aesthetic Plastic Surgery and the American Society (ASAPS) of Plastic Surgeons (ASPS), I only operate in Fully Accredited Operating Rooms. Professional societies are not all created equally. The ASAPS and ASPS are two of the most stringent when it comes to member requirements. Not only is proper training, ethical standards and board certification required, but every member is required to operate exclusively in Accredited Ambulatory Surgery Centers when anything other than local anesthesia is required. The reason — Patient Safety. Accreditation is performed by a limited number of regulatory bodies to assure the public that a Surgery Center is up to standards for both physical and administrative operations. Physical Characteristics: include building codes like width of halls and doorways, construction materials, fire exits, power backup, oxygen safety and delivery and environmental heating, cooling and ventilation. Also included are the types of equipment kept on site for anesthesia, life support, sterilization and fire suppression. Administrative Operations: include how patients and their private medical information are handled, as well as staff selection and peer review, drug tracking and data tracking of procedures and complications. Don’t be fooled by doctors promoting the safety of surgery done under local anesthesia. They may be masking an unaccredited facility and the inability to offer general anesthesia. Often, they will offer lower prices, because accreditation may not be the only corner they are cutting. Unfortunately, it is not cheap to maintain accreditation. Regulations change frequently. Often, consultants are hired before inspections to be certain the latest rules are being followed. The cost of the inspection is borne by the facility, and this is in addition to meeting additional building requirements and having the proper well maintained equipment. Often, multiple types of accreditation is required, and inspections may be required every three years or more, depending on the agency and the findings during inspection. Below is a list of the current nationally recognized accrediting bodies. 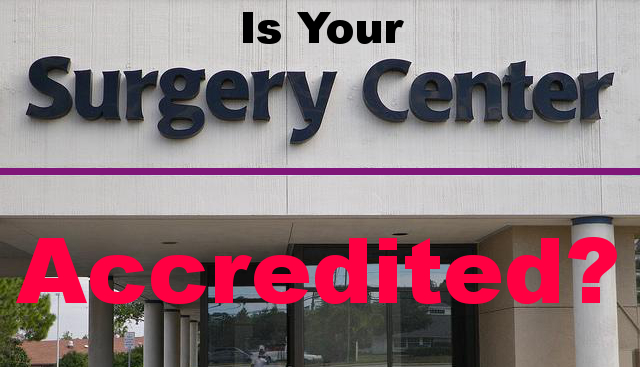 Ask your surgeon, or better the surgery center directly, which they are accredited by. You can also use the links below to learn more about the accrediting organizations. Using only Accredited Surgery Centers is just one more way that your Plastic Surgeon can demonstrate that they care about your safety. If your surgeon is using accredited surgery centers, they will not be offended if you ask them. The hospitals and surgery centers I use are accredited by the state, federal (medicare) and at least one other of the above agencies. The Accreditation Association for Ambulatory Health Care (AAAHC) and the Joint Commission on Accreditation of Healthcare Organizations (JCAHO) are two of the national recognized accreditation bodies in the United States. John Muir Hospital Walnut Creek, John Muir Hospital Concord and San Ramon Regional Medical Center are all JCAHO Accredited, while Premier Surgery Center, Diablo Valley Surgery Center, Aspen Surgery Center and Sequoia Surgical Center are all AAAHC Accredited. This accreditation gives me peace of mind that every facility is regularly checked by an independent organization dedicated to the safety of my patients. It also means I can spend more of my time taking care of you. Most surgical procedures are outpatient, meaning you can go home the same day. This is true for all surgery performed in the United States, not just Plastic Surgery. The vast majority of these procedures are performed in an ambulatory surgery center. In fact, there are not enough hospital operating rooms to accommodate the volume of surgery performed in ambulatory surgery centers. Without them, we could not provide appropriate patient care in a timely manner. The main difference between a surgery center and a hospital is the amount of time you can spend there. Legally, an ambulatory center can keep you for 24-hours. After this time, either you should be safely on your way back home or transferred to a hospital if additional care is necessary. There are other differences which may not be as obvious. Hospitals are for sick people, so that is where you find them, along with the diseases they are suffering from. Some of these diseases are contagious, and if you do not require the higher level of care that a hospital provides, staying away from the inpatient setting also means staying away from sick people. On the other hand, if you have multiple medical problems, or require a complicated surgical procedure, the higher risk of the hospital setting is more than balanced by the additional care that they provide. Convenience is another factor that the ambulatory surgery center can provide. While Safety is number one, Predictability is a close second. Since Surgery Centers deal with healthier patients and less complicated procedures, they are more likely to run on time. Unlike a hospital with emergency rooms and trauma centers, there are few emergencies to “bump” the operating schedule and cause understandable, medically necessary but inconvenient delays. This is the operating room for cardiovascular surgery at Gemelli Hospital in Rome, Italy. This hospital operating room is specialized, provides a higher level of care making it very expensive, and excessive, for Face Lifts or Breast Augmentation. Cost is another factor. Ambulatory Surgery Centers do not need to be staffed 24-hours a day, and do not need all the additional equipment needed for the most complicated surgical procedures. Because of this, the hourly rate for an operating room located in an outpatient center averages significantly less then the hourly rate for an operating room located in a hospital. If you are considering Cosmetic Plastic Surgery in the San Francisco Bay Area, give me a call at (925) 943-6353. By using only accredited facilities, my goal is to provide you with the safest and most predictable results possible.